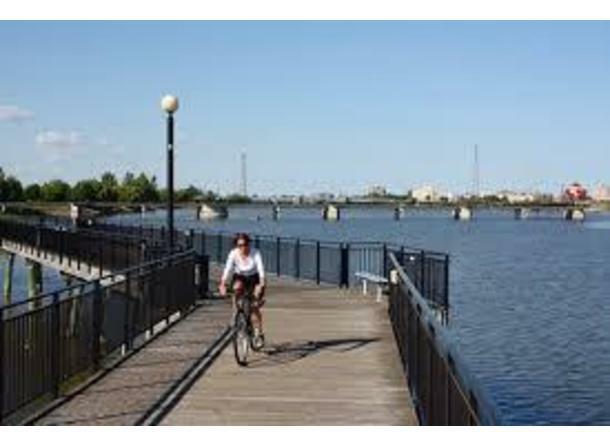 The Bay County Riverwalk/Railtrail System shows community at its best, offering plenty of sights, sounds and activities along its route through Bay City and its parks, and through the residential and agricultural areas of Portsmouth, Hampton and Bangor townships. There are dozens of places to access and jump off the trail, and each one offers convenient parking and facilities, as well as clear signs to help you navigate the route. The trail's striking scenery is as diverse as the type of path you will follow. As scenery changes from woodlands and marshes to riverfront views and ball fields, the trail surface changes from asphalt to sidewalk alongside major roads, to boardwalk along the waterfront and back to asphalt through the residential neighborhoods and rural township lands. The trail is shaped like a noose, with access points all along it. One starting point is on the northern end at the Bay City State Recreation Area (fee parking) where you will be treated to a sweeping vista of Saginaw Bay and the adjacent Tobico Marsh. In the first mile, the path—also known as the Frank N. Andersen Nature Trail—connects with hiking trails to the west and an overlook platform with views of the marsh and the bay. Keep your eyes out for the interpretive signs along the trail, and stop to visit the nature center with its exhibits on what there is to see while you are here in this unique topography. After 2.5 miles you leave the recreation area and travel through fields of wildflowers along a utility corridor that travels to downtown Bay City. At mile 7, follow the wide sidewalk connectors to and through Bay City's commercial and entertainment district, where you can access ball fields, a skate park and playgrounds at Defoe Park. A half mile later you arrive at Liberty Bridge, which marks the start of the 9.5-mile Bay City Loop part of the system, traveling through downtown and the surrounding agricultural lands. A half mile into this loop, you reach the heart of downtown, where eateries will tempt you with a variety of ethnic cuisine. From downtown, the trail continues to a bustling marina and the popular waterfront Veteran's Memorial Park, featuring beautiful gardens, riverside benches and memorials of shipbuilding days gone by. 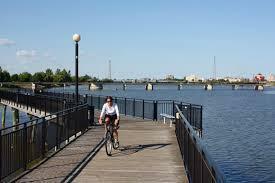 The waterfront section features several ball fields, picnic areas and playgrounds. At mile 9 bird-watchers will enjoy the stretch of trail that follows a boardwalk for a few blocks over the Saginaw River. A mile later, the trail courses through a distinctly residential district, where private gardens are resplendent with delightfully bright blooms. After Youngs Ditch Road near mile 13, and about halfway through the loop, the corridor opens up for a smooth pass through agricultural lands and countryside that will appeal to nature lovers.